Thank you Shannon Y. for sharing this ADORABLE baby set of matching Blanket and Burp cloth. Shannon used our Lacy Girl Monogram font #39. I made this little door hanger for Meg using our Applique Dots Monogram Font # 48. 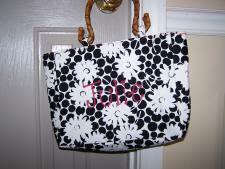 Thanks again Robin Lack for sharing pictures of 2 beautiful purses. They are beautiful! Robin used our Cool Dots Embroidery Font to personalize. Thank you Nancy for sharing pictures of adorable shirts and blankets you personalized using our Curlz, and Cool Dots embroidery fonts. Great Job on everything! I embroidered these jeans for Amelia using our Funky~Groovy~Hippy Flowers Monogram font #40. Thank you Mary for sharing pictures of Hayleigh's beautiful blanket you made with our Lacy Girl Monogram font # 39. Just beautiful! Thank you Shannon for sharing this ADORABLE bib for Marley. 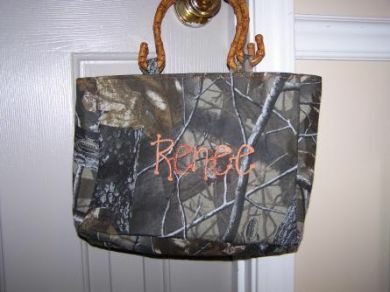 Shannon used our Monogram Name 2 font (also known as Annie Font). Thanks to Hollypops Monogrammed Gifts for sharing the adorable burp and bib set. Very Sweet. Holly used our Whimsy Dots Monogram Font. Love them!